Junior Infants Room 5: We Are Scientists! To celebrate national Science Week Room 5 have become scientists! We have been doing lots of scientific thinking and investigations using magnets, exploring different magnetic materials. We have also been discussing the pushing and pulling forces created by magnets. 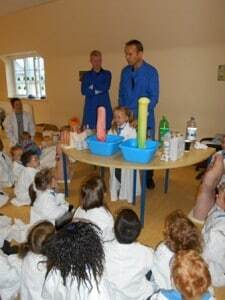 Today we were lucky enough to have a visit from Dr. David Fitzpatrick (Zoe’s Dad) who helped us to conduct experiments. We used iodine to test our favourite foods for starch – this gives us lots of energy. We tested bread, cornflakes and mushrooms. Which ones do you think contained starch? Next, we tested milk, water and 7up for protein. Dr. David explained that protein helps us to grow big and strong. Which one do you think contains protein? Room 5 have learned lots of different skills and week and have had fun being scientists – thank you Dr. David! For more photo’s of us doing our experiments click here.